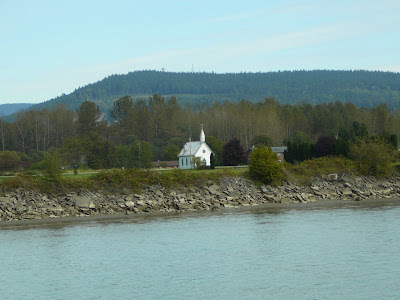 This cute little church sits on the Fraser River near Fort Langley, B.C. In a two-chapter section of Revelation, Jesus speaks to John in a vision and gives him a message for seven early church congregations. It is a type of report card – the kind we got in school – and like all good evaluations, each church’s report begins with a mention of something positive. Jesus commends the church at Ephesus for its labor, patience and revulsion of all that is evil. He gives kudos to the church at Smyrna for the way it clings to true riches despite outward poverty and opposition. He compliments the church at Pergamos for its steadfastness even though it is located in the very hub of Satan’s territory. Then comes the bad news. The Ephesus church has lost its first love. The Smyrna church is tolerating some blasphemers and is fearful of suffering. The Pergamos church is giving a platform to false teachers. To each congregation Jesus ends with the admonition to listen to what the Spirit says to the church. It’s easy to see a reflection of ourselves and our local churches in these particular congregations. However, this passage has me also asking about the big picture. What does the Spirit expect of the church as a whole? What is the standard to which it was, and is being held? What are God’s ideals, hopes and aspirations for it? 1. The church is God’s idea. It was divinely instituted - 1 Timothy 3:15. 2. It is called the Body of Christ - 1 Corinthians 12:27. 3. Jesus is the head of it - Ephesians 2:19,20. 4. The church is precious to Him - Ephesians 5:25-29. 5. The Bible refers to the church as Christ’s marriage partner through whom we "bear fruit" - Romans 7:4. 6. Some of His main concerns for her are that she present herself faithful and pure - 2 Corinthians 11:2. In our time where, in some circles, church-bashing is fashionable, let’s get our focus back on the fact that God loves the church and has a wonderful plan for it. Are you part of a local church congregation? Are you supportive of it? Or do you criticize it and its leaders? What is God’s Spirit saying to you about your local church and your part in it? When I read this part of today’s passage, I immediately thought of the e-cards available from artist Donna Smallenberg, and specifically the one that was inspired by this verse. If you send e-cards, you may want to check these out. There is a yearly subscription fee – but I’d say it’s well worth it to have a set of such beautiful and inspirational cards at your fingertips.